Whether it was a biker movie starring one of the original Easy Riders like Peter Fonda or Jack Nicholson or even a stock car racing picture with Annette Funicello and Fabian-- director Richard Rush had a particular affinity for films that moved as if on the same wheels he loved to incorporate throughout his body of work. Making movies that sometimes careened out of control like a car sliding on an icy turn or a motorcycle skidding on wet cement-- he created the original and literal Fast and the Furious picture with the cult classic '70s buddy cop movie Freebie and the Bean which later became a short-lived television show. So politically incorrect that even Lenny Bruce may have done a double take (of course had he written it, the jokes would've consistently sped through green lights as opposed to losing hubcaps in several potholes along the way), it nonetheless seems to have been utilized as the most outrageous paradigm later worked to death in the following decades with movies like Lethal Weapon, 48 Hours, Beverly Hills Cop, Stakeout, and Bad Boys. And, especially considering its over one hundred car crashes-- Freebie and the Bean is exactly the type of film you just know Blues Brothers director John Landis giddily wanted to top with Aykroyd and Belushi's "mission from God." Not above emptying out the contents of the trash can used by a racketeering baddie into the trunk of their car in order to search for clues-- it's safe to say that instead of the traditional "good cop, bad cop" routine, in the case of Rush's characters (which were developed by screenwriter Robert Kaufman from a story of Floyd Mutrux)-- we're basically dealing with "unstable cop" and "crazy cop." 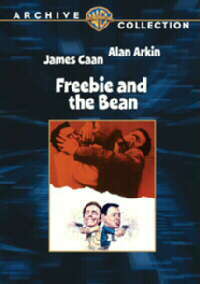 If you can overlook some of the tasteless humor (especially involving one gay character and overall the entire despicable character of Freebie as well), then you can shut your mind off and belt yourself into the car alongside James Caan's bigoted, wise-cracking Freebie and his Latin American partner Alan Arkin, whom he calls "Bean" (when not otherwise seasoning him with ethnic jokes). And likewise, you will definitely have to get past the frankly ridiculous casting of Arkin in the role that no doubt appealed to the same illogical school of thought that found Charlton Heston playing a Mexican in Orson Welles' brilliant Touch of Evil not to mention the fact that absolutely nothing about these cops' actions would fly for real on the job. Despite this, it's a mile a minute rapid fire literal smash fest that leaves no car unscratched (with most totaled) or any group without offense as I was shocked to discover the film was actually banned in Sweden! Amusing despite the relative absence of any real plot other than the increasingly ridiculous stunts the guys pull to nab their man, the movie-- which has just been released as part of the Warner Archive Collection (exclusively from the WB Shop and available as a DVD or digital download)-- gained a cult following despite what I read was fierce competition from the overall better-received and similarly constructed Elliot Gould/Robert Blake vehicle Busting from director Peter Hyams. Entertaining but definitely showing its age on a number of levels-- the one real bright spot aside from being a car crash movie lover's dream is in the surprise Golden Globe nominated turn by Valerie Harper as Bean's beautiful wife who keeps her cool and retains logic while he uses a cop's approach in questioning her for what he assumes is an extramarital affair. While I'm certain it's probably not one of Godfather star James Caan or Oscar winner Alan Arkin's most beloved performances, it's still a mindless Saturday afternoon time waster. Additionally it's one that no doubt inspired as many subsequent opposites attract cop buddy films as it did offend viewers who simply tuned in without being aware of what exactly they were getting into as they were quickly side-swiped by Rush's style that plows everything home with as much damage as possible for the sake of "only in the movies" entertainment.